Betsy and I are always on the hunt for a quick treat that’s easy to make, somewhat healthy, and very flavorful. It’s a struggle to not just reach for a bag of chips every single time. Recently though, I was walking through the store and there were some pretty good looking strawberries and right next to them were these big bunches of basil. I picked some up and the next time we were hunting for a treat, this idea just popped in my head. It’s a really simple dish that’s just some marinated strawberries and fresh basil on an English muffin with a good schmear of cream cheese. It’s so easy that I almost didn’t post on it, but it turned out to be so good that I figured everyone should know about it. 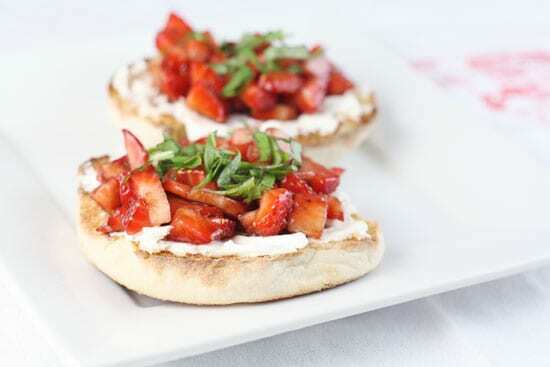 Fresh strawberries marinated in balsamic vinegar and added to an English muffin with some fresh basil. Quick and delicious! 1) Cut off strawberry stems and dice. Add to a bowl with balsamic vinegar and a pinch of salt and sugar. Stir and set aside for a few minutes. 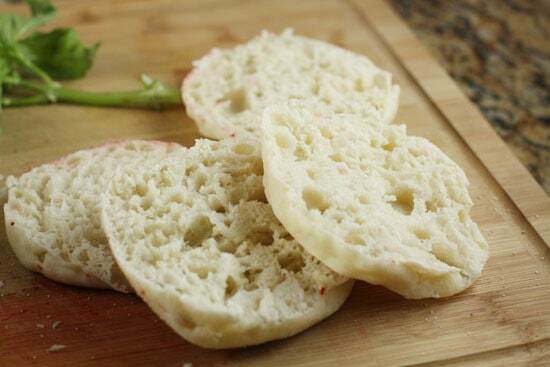 2) Chop basil and toast english muffins until well-toasted. 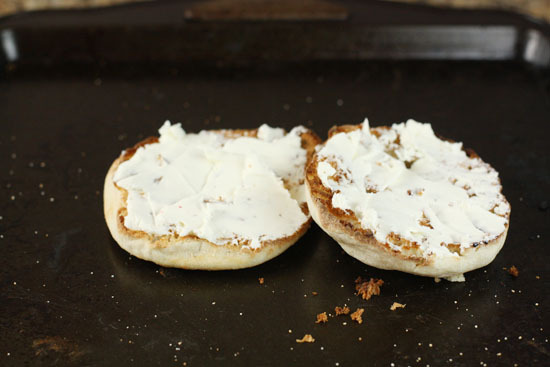 3) Add cream cheese to each half of the muffins. 4) Top with strawberry mixture and fresh basil! It’s not even clear if you can call this a recipe really. It’s about as easy as recipes get if it is one. In any event, I took some photos because strawberries are fun to photograph. 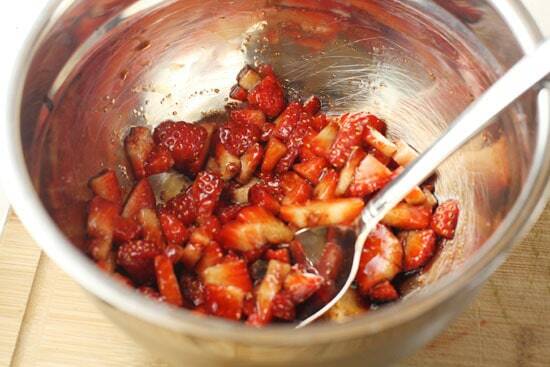 Chop off the stems and dice up the strawberries. Then mix them with a good drizzle of balsamic vinegar and a pinch of salt and sugar. Let this sit for a few minutes while you prep the other ingredients. Plus a drizzle of balsamic. 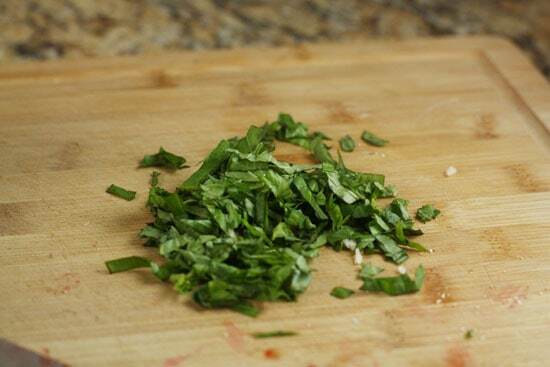 Chop up some basil. Not rocket science. 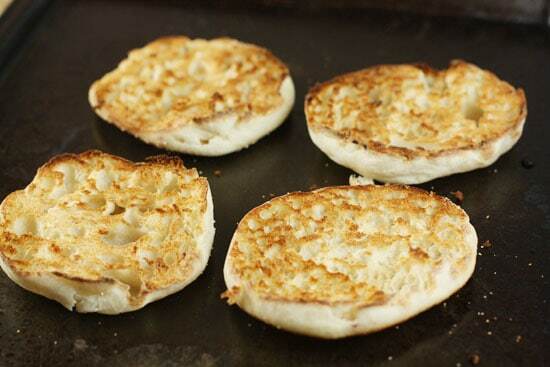 Slice up a few English Muffins. I used store bought, but if you’re feeling ambitious you could try making your own English Muffins. I like my English muffins really toasted and I’ve found that the best way to get them there is actually in the broiler. I crank it up to high and lay them out on a baking sheet. After 4-5 minutes, they are perfectly toasted. You could, of course, just use a toaster though. I like using a broiler, but a toaster works also. Take each half of the muffin and add a good schmear of cream cheese to it. Then top each half with a good heap of the marinated strawberries and sprinkle on some basil! This is a record short post for me, but it’s just that easy. The flavors are fantastic though. 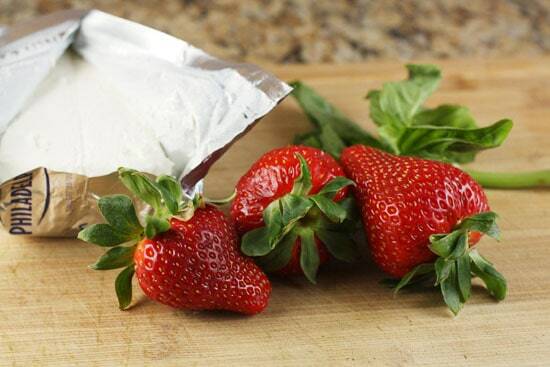 If you make it once for friends or family, they will definitely be asking for “that strawberry thing” all the time. The cool gun napkin in this post was nicely provided by Oh Little Rabbit, one of Betsy’s favorite Etsy stores. Basil & fruit are so great together — I love basil with watermelon & goat cheese, too. This sounds like the perfect almost-kind-of-elegant breakfasty/brunch treat. I make a strawberry basil cocktail that is really yummy! I never thought the two would be a good combination, but strawberries & basil works quite well together. I am going to have to try this recipe out. Thanks. My goodness, this sounds like summer on a plate. Delicious, and deliciously simple. I've been buying Sweet Grass Dairy's Fresh Chevre at Whole Foods here in Atlanta. I'm addicted to it. I will try using it in place of the cream cheese. It sounds like a recipe I will use often , especially while strawberries are in season. Thank you for posting it! 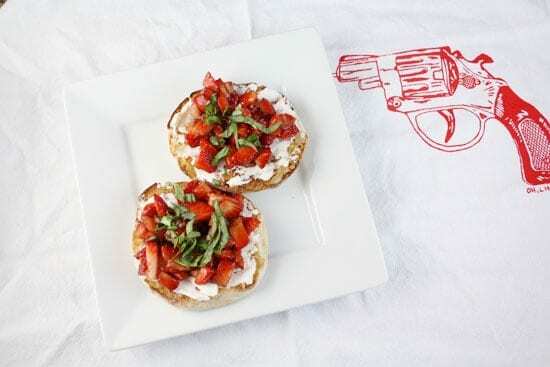 Don't shoot That Strawberry Thing! One of the most memorable desserts I've had to date was at a French restaurant in South Africa that did something similar. No bread or cream cheese… just scrumptious strawberries marinated in balsamic vinegar, with a little salt and fresh black pepper and basil. Salivating thinking of it now. Such a simple post, but such a great idea, especially the basil. thanks for posting this! I never would have thought of such an awesome combo.